I have recently become a fan of false eyelashes. When I was a teenager experimenting with makeup like most teenaged girls, I wore (or tried to wear) false lashes. I had no idea what I was doing; I was on my own because I would not ask my mother or sister for help. I usually ended up with a sticky mess, crooked lashes, or lashes that became loose and disappeared down my blouse! As a result, I was not a big fan of false lashes and seldom bothered with them except for special occasions. A few times, I had successful lash experiences on those special occasions, but most times I was not. When I had my pre-banquet makeover at Fantasia Fair in October, I paid close attention to how Hera applied my false lashes. I was so impressed with the results that I did some research and successfully applied what I learned when I did my makeup for One Big Event last month. After that successful do-it-yourself false lashing, I considered wearing false lashes all the time. My lashes are thin and mascara can only take them so far --- nowhere near what false lashes can do. On the other hand, most of the false lashes I have worn were too over the top for everyday wear, so I shelved the idea of wearing false lashes all the time. Yesterday, I was Christmas shopping. When I passed the cosmetics aisle, I checked out their false lash offerings and discovered lashes that might work for everyday wear. They are Revlon's Beyond Natural brand of lashes, specifically the "Flirty" and "Defining" models, which I think will enhance my lashes without going over the top. I purchased a set of Defining lashes and will wear them next time out: the Avon representative Christmas party next Tuesday. Tomorrow, I will describe how I put on and take off my false lashes. Until then, keep on femulating! The next time I bump into you, please have an Avon catalog with you.... Only one problem - I think it'll be at next year's Fantasia Fair. 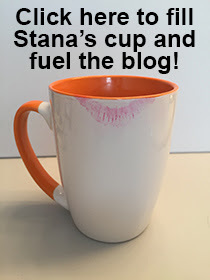 Maybe it was because I use duct tape to keep my false eyelashes on (so they stay there for weeks at a time), but I just noticed that your blog's masthead reads "Stana's Femulate". You go, girl! I LOVE you and your lovely blog, and I'm very happy that you added your name there. When did you make the change? Please don't tell me it was weeks ago! LOL! I've worn false lashes since I left home. Not only do they provide feminine freedom, they give a girl like me a fantastic look! The ones I wear are obviously fake lashes (- kind of like the rest of my body!) way thicker and longer than anything I could grow. I get NO comments about how they look from the guys I date, so, I merely assume they look natural. But I know better! The focus is not on them, the focus is on other things. Marian --- See you in October! Sheila --- I updated the masthead on Friday. Also, over the weekend, I revised the layout of the blog; it is now two columns instead of three.